Sometimes the best music presents us with the answers: This is how it is, and this is how it should be. Other musical explorations seem to ask Beethoven’s question: Must it be? Or perhaps What lies beyond? The quartet of musicians who enlarged our horizons on April 13, 2013, at the Finland Center, asked the latter question — sweetly, not abrasively — and let us compose our own answers. They are Lena Bloch, tenor saxophone; Frank Carlberg, keyboard; Billy Mintz, drums; Dave Miller, guitar. I invite you to join their inquiries, to allow their music to lift you aloft. All of these fine vibrations were created by these four eminent courageous players . . . but we also thank Janna Rehnstrom of the Finland Center Foundation for giving this music a home — for establishing a regular concert series here, at the Salmagundi Club, 47 Fifth Avenue, New York, New York — details here. Don’t let the title upset you: there are no victims here. 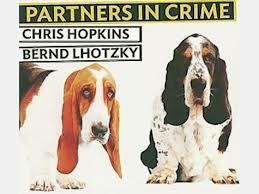 And the mournful basset hounds are misleading: this isn’t morose music. It is a two-piano recital by the sterling players Hopkins and Lhotzky. And it’s almost an hour of absolutely gorgeous music. What distinguishes this from other discs in the idiom is something rare and irreplaceable. Taste. Chris and Bernd are not only astonishing technicians who can scamper all over the keyboard and make joyous noise. But they are wise artists who know that a rich diet of auditory fireworks soon palls. Although they are harmonically sophisticated musicians, Bernd and Chris know that melody and variety are essential. “Sweet, soft, plenty rhythm,” said Mr. Morton, and he hasn’t been proven wrong. So this disc doesn’t wallop us with pyrotechnics — there is a James P. piece, JINGLES — but it roams around happily in the land of Medium Tempo with delicacy and precision. It isn’t Easy Listening or music to snooze by, but no crimes are committed against Beauty here. What’s more, these players have understood how to plan a concert — even when the imagined audience may be driving or doing the dishes — so there is never too much of any one approach or style. The disc begins with the Ellington-Strayhorn TONK (which, once again reminds me of Gershwin in Paris and Raymond Scott in his studio), then moves to a lacy reading of Fud Livingston’s IMAGINATION, Arthur Schutt’s GEORGIA JUBILEE, Thornhill’s SNOWFALL, I GOT PLENTY O’NUTTIN’, the aforementioned JINGLES (a masterpiece at a less-than-frenzied tempo but swinging hard), a lovely Hopkins solo rendition of SOMEONE TO WATCH OVER ME, Bernd’s SALIR A LA LUZ (dedicated to Isabel Lhotzky, the Lion’s SNEAKAWAY as a solo for Bernd, Bernd’s FIVE 4 ELISE (whimsically based on FUR ELISE), Chris’ PARTNERS IN CRIME, DOIN’ THE VOOM VOOM, RUSSIAN LULLABY, I BELIEVE IN MIRACLES (for Mr. Waller), and Nazareth’s APANHEI-TE CARAQUINHO. Discerning readers will note the absence of AIN’T MISBEHAVIN’ and other songs that have been played many times in the last ninety-plus years, but this disc isn’t devoted to the esoteric for its own sake. Each of the songs has a strong melodic line: the listener never gets bored, for even the most familiar one here — say, SOMEONE TO WATCH OVER ME — is handled with great tenderness, elegance, and a spacious intelligence, as if the players already knew what cliches and formulaic turns of phrase were possible, and had discarded them in favor of a loving, deep simplicity. Even their 5 / 4 version of FUR ELISE is delicately hilarious. And — as an added bonus — the disc is beautifully recorded in the old-fashioned way: two Steinway pianos and one pair of Sennheiser omni-directional microphones. It’s music for the ears, the heart, and the mind — and (without meaning any acrimony here) the disc is a quiet rebuke to pianists who pound their way through the same tired repertoire and record producers who make it sound artificial. It’s a beauty, and it celebrates Beauty. You can buy the disc here. Or hear samples of Amazonian mp3s here. Or the EyeTunes version here. People who live for jazz recordings and performances are often surprised to find that jazz musicians need a more balanced diet — what Ruby Braff called “aesthetic vitamins.” Coleman Hawkins listened to the “modern classical music” of his day, as did Bix, and Louis drew energy and solace from John McCormack records. The anecdotes below are testimony from most illustrious sources. And, since the universe seems occasionally to operate harmoniously, they came to me — independently — in the last two days. When I interviewed Vic Dickenson years ago and asked him what trombone playing he had listened to in his formative years (making the point, as you will see, wrongly, that trombone playing back then (Vic b. 1906) was of the tailgate variety) he didn’t say anything but went to his small collection of records, pulled out an old 12-inch 78, and put it on. It was a beautiful version of Celeste Aida by Arthur Pryor, Sousa’s trombone soloist and assistant conductor before going out on his own, and most certainly known to Tommy Dorsey. These are the kind of things you won’t learn from most jazz history sources. And here is a generous website featuring “recordings from the nineteenth century,” where you can hear THERE’LL COME A TIME, made in 1897, featuring Pryor, whose playing is astonishingly mobile. Although the link probably does not work within this post, visit http://home.clara.net/rfwilmut/19thcent/19th.html. No one thinks about jazz people’s interest in classical music. Bird listening to Bartok, that awesome tale of Dave McKenna playing the Ravel Piano Concerto chilling out after a record date. “But Dave – you can’t read music -” “Yeah I know. I learned it off a record”. And a friend staying in a hotel in Chicago where Earl Hines was playing. He comes down for breakfast late; after he goes to the lobby and the door to the nightclub is ajar. Hears piano. By the bare single ‘off duty’ light Hines is working on Beethoven’s Sonata Op. 111 — the really hard one. Oh – & AL Haig only practiced Chopin. I took the photograph above about ten months ago. It is my version of “where inspiration comes from.” Anyone care to guess the country and region?